Breitling, Richard Mille, TAG Heuer, and Hublot have produced four collaborative timepieces fashioned with impeccably crafted attention to detail. A celebrated twist on the style, aesthetics, and the Manufacture of the Breitling Calibre B06, the 500-piece limited edition Breitling Bentley GT “Dark Sapphire” Edition Chronograph privileges Breitling’s new Breitlight® polymer over steel or gold. With over 28,800 vibrations per hour, 47 jewels, and a 70-hour power reserve, the 48 mm diameter Dark Sapphire-pattern chronograph also boasts 30-second stopwatch functions, 6-hour totalizers, and two-sided glare-proofed sapphire crystal. On the automotive side of the spectrum, Dark Sapphire pays homage to the opulence of Bentley’s Continental GT, fusing British automotive manufacture and Swiss watchmaking. Breitling chronograph “engines” are powered by Breitling’s COSC-certified B06 chronograph movement. Black leather strap included. Launched at the 88th Geneva International Motor Show, the RM 11-03 is Richard Mille and McLaren’s first collaborative effort. Celebrating both material innovation and shared DNA, the case is made of carbon and Orange Quartz TPT (Thin Ply Technology). The dark layers of carbon fiber were introduced by Richard Mille back in 2013. The RMAC3 calibre—launched in 2016—sports a flyback chronograph and a 55-hour power reserve; the vibrant magma orange, silica fiber; and a dial that features an oversized date, an annual calendar, and a 12-hour chronograph with yellow counter accents. But the collaboration’s beauty comes through in the 5-grade titanium crown that resembles a McLaren wheel; the pushers, McLaren 720S headlights. Made from PVD-treated grade 5 titanium, the RM 11-03 takes its pusher at 9 o’clock, and start-stop reset functions at 2 and 5, from the RM11-02 and RM 11-02 NPTP. Truly one of Richard Mille’s finest. The TAG Heuer-Aston Martin Racing big reveal came at this year’s Geneva Motor Show. The partnership showcases the automotive giant’s title sponsorship of the Aston Martin Racing Formula One Team, highlights Aston Martin streetcar models, and Aston Martin’s motor racing and performance. Inspired by James Bond’s favourite sports cars, the TAG Heuer Formula 1 is the penultimate racing timepiece. The partnership move is also an effort to appeal to a younger luxury demographic. The Formula 1 chronograph is a 43mm quartz with a notched aluminium and black matte tachymeter steel bezel, and black dial with lime essence (and grey 60 seconds scale). The steel screw-down case back has “ASTON MARTIN SPECIAL EDITION” engraved. Hublot’s Techframe Ferrari 70 Years Tourbillon Chronograph, under the leadership of Flavio Manzoni and designed by Ferrari, used the same creative processes to develop new sports cars. Movement—the “engine” of the watch, is designed like a high-performance chassis; and much like that of a Ferrari, its lattice structure offers maximum strength for minimal weight. The HUB6311 calibre with manual winding—253 components —offers a 5-day power reserve. The single-button chronograph (for the start-stop reset functions), is handled by an original lever in Ferrari red anodised aluminium. 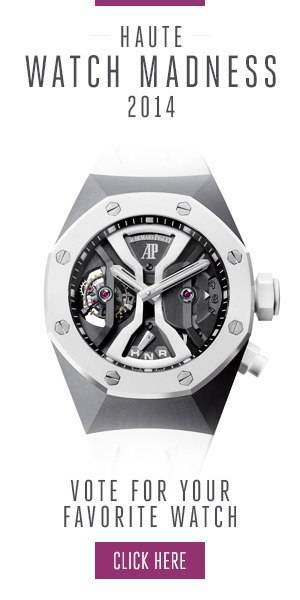 So when Hublot partners with the likes of a Bolt, Mayweather, or celebrates Ferrari’s 70th with their Techframe 70 years Turbillon Chronograph, rest that assure that a deep understanding of radical, forward-thinking innovation is in every timepiece.